If there’s one myth – and there are many – that we should invalidate in the cross-over world of politics and economics, it‘s that central banks have saved us from a financial crisis. It’s a carefully construed myth, but it’s as false as can be. Our central banks have caused our financial crises, not saved us from them. You can pin the moment central banks went awry at any point in time you like. The Bank of England’s foundation in 1694, the Federal Reserve’s in 1913, the ECB much more recently. What’s crucial in the timing is where and when the best interests of the banks split off from those of their societies. Because that is when central banks will stop serving those societies. We are at such a turning point right now. And it’s been coming for some time, ‘slowly’ working its way towards an inevitable abyss. Greenspan was a major driving force behind the repeal of Glass-Steagall, which was finally established through the Gramm-Leach-Bliley act of 1999. This was an open political act by the Federal Reserve governor, something that everyone should have then protested, and still should now, but didn’t and doesn’t. Central bankers should be kept far removed from politics, anywhere and everywhere, because they represent a small segment of society, banks, not society as a whole. Greenspan et al ‘simply’ did what central bankers do: they represent the best interests of banks. And the world’s central bankers have never looked back. That most people still find it hard to believe that America – and the west – has been getting poorer for the past 30-40 years goes to show how effective the narratives have been. The world looks richer instead of poorer, after all. That this is exclusively because of rising debt numbers wherever you look is not part of the narratives. Indeed, ruling economic models and theories ignore the role played by both banks and credit in an economy, almost entirely. The narrative has switched to Bernanke, and Yellen after him, as well as Mario Draghi at the ECB and Haruhiko Kuroda at the Bank of Japan, saving the world from doom. But once again, they are the ones who are creating the crisis, not the ones saving us from it. They are saving the banks, and saddling the people with the costs. In the past decade, these central bankers have purchased $20-$50 trillion in bonds, securities and stocks. The only intention, and indeed the only result, is to keep banks from falling over, increase their profits, and maintain the illusion that economies are recovering and growing. They can only achieve this by creating bubbles wherever they can. 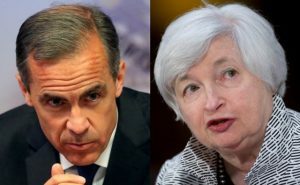 Apart from the QE programs under which they bought all those ‘assets’, they used – and still do – another tool: lowering interest rates to the point where borrowing money becomes so cheap everyone can do it, and then do it some more. It has worked miracles in blowing stock market valuations out of all realistic proportions, and in doing the same for housing markets in locations all over the globe. Fast forward to today and we see that we’ve landed in a whole new, and next, phase of the story. The world’s central banks are all stuck in their own – self-created – bubbles and narratives. They all talk about how they solved all the issues, and how they will now return to normal, but the sad truth is they can’t and they know it. That is, the world’s central bankers now have an incentive to create the next crisis. This is because they know this crisis is inevitable, and they know their masters and protégés, the banks, risk suffering immensely or even going under. ‘Tapering’, or whatever you might call the – slow – end to QE and the – slow – hiking of interest rates, will prick and blow up bubbles one by one, and often in violent fashion. When housing bubbles burst, economies lose the primary ingredient for maintaining – let alone increasing – their money supply: banks creating money out of thin hot air. Since the money supply is one of the key components of inflation, along with velocity of money, there will be fantastic outbursts of debt deflation. You’ve never seen – let alone imagined – anything like it. The worst part of it is not government debt, though that, when financed with bond sales, is not an instrument to infinity and beyond either. But the big hit to economies will be private debt. Where in many bubble areas, and they’re too numerous too mention, eager potential buyers today fret over affordable housing supply, it’ll all turn on a dime and owners won’t be able to sell without being suffocated by crippling losses. Pension funds, which have already suffered perhaps more than any other parties because of low interest ZIRP and NIRP policies, have switched en masse to riskier assets like stocks. Well, another whammy, and a bigger one, is waiting just outside the door. Pensions will be so last century. That another crisis is waiting to happen, and that politics and media have made sure that just about no-one at all is aware of it, is one thing. We already knew this, a few of us. That the world’s main central bankers have an active incentive to bring about the crisis, if only by sitting on their hands long enough, is new. But they do. Yellen, Draghi and Kuroda may opt to leave before pulling the trigger, or be fired soon enough. But whoever is in the governor seats will realize that unleashing a crisis sooner rather than later is the only option left not to be blamed for it. Let the house of dominoes crumble now, and they can say “nobody could have seen this coming”, while at the same time saving what they can for the banks and bankers they serve. That option will not be on the table for much longer.